Ronald Reagan grew up in Illinois. His father was a shoe salesman. When he was very young, his mother read to him, moving her finger under the words as she read aloud. He taught himself to read by looking at the words as she read, and by the time he was five years old he could read the newspaper. His mother was an amateur* actress performing onstage in local productions. She encouraged her boys to participate in the theater and public readings. These experiences served him well in later life as he became an actor and an excellent public speaker. After finishing high school he graduated from Eureka College. Upon graduation he worked as a radio sportscaster, then hosted some TV shows. General Electric hired him to give talks to its employees. He visited all 139 GE plants and gave two or three speeches a day. He became an actor and his acting career spanned several years. He was active in the Screen Actors Guild helping his fellow actors. He was married twice, both times to actresses. His first wife was Jane Wyman. They had a daughter and adopted a son. After their divorce he married Nancy Davis with whom he had a daughter and a son. They would be married for more than 50 years. During World War 2 he served as a captain in the Army Air Corps making training films for pilots. After the war he switched political parties and became a Republican in 1962. In 1967 he was elected governor of California. Reagan was a conservative* regarding his policies. He set out to reform the welfare* system which was out of control in California. In 1967 the California Welfare Act was signed and in 1971 he signed a welfare reform bill which required mothers and fathers without young children to work. The guidelines became stricter and the number of people on welfare was reduced. Within three years it had saved the California taxpayers 2 billion dollars. In 1976 he tried to win the Republican nomination for President of the United States, but Gerald Ford was the nominee that year. Ford, however did not get elected and Jimmy Carter, the Democratic candidate became President. 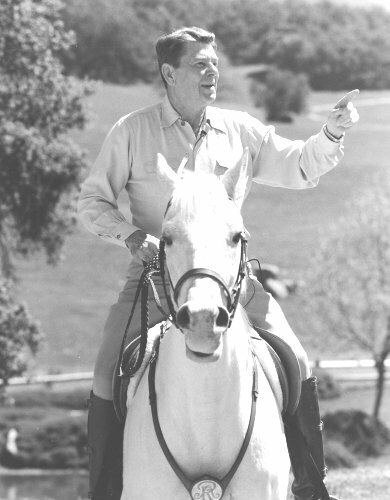 Reagan was elected governor of California for a second term, then in 1980 he tried again for the Presidency and was elected winning over Jimmy Carter. Reagan had 489 electoral* votes to Carter's 49 votes. When he became President one of his priorities was to increase the national defense and he advocated increased spending in that area. He pushed the Star Wars missile defense system. Under his leadership the economy stablized. During his first term as President he appointed Sandra Day O'Conner to serve on the Supreme Court. She was the first woman to ever serve in that capacity. He proved to be so popular he won reelection in 1984 against the Democratic nominee, Walter Mondale. In that election he got 525 electoral votes to Mondale's 13. He advocated a smaller role of government in the lives of people. He bravely spoke out against abortion and forprayer in the schools. There was an attempt on his life in 1981 when John Hinkley shot him in the chest. He nearly died, but fully recovered from the attack. His press secretary James Brady was struck in the head by one of the bullets and was not so fortunate. He suffered permanent brain damage due to the wound. After that incident stricter gun laws were enacted. Reagan delegated authority whenever possible. He believed, "If anyone else can perform a task as well as or better than you could, you should not do it." He had a clear vision of the things he wanted to accomplish, and if a person was getting off-target, he would talk to that person and help him/her come to a better understanding of the goals. For many years the United States and Russia had been engaged in what people termed a "Cold War". * There was no shooting or bombing, but there were ill-feelings and a distrust on both sides. Once in a meeting with Russian leader Mikhail Gorbachev, when they couldn't agree, Reagan walked out on him. Reagan stood his ground. The Berlin Wall had been erected by the East German army after being advised to do so by the Russian leaders, thus dividing East and West Germany in 1961. 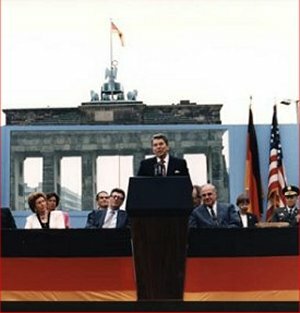 Then on June 12, 1987 Ronald Reagan said to to the Russian leader, "Mr. Gorbachev, tear down this wall!" Within two years people were traveling freely between the two sectors. He had communicated. The wall came down. 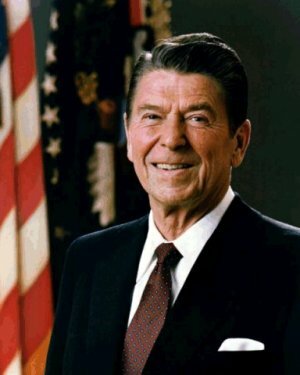 Prime Minister Margaret Thatcher said of Ronald Reagan, "He won the Cold War without firing a shot." While he was President, Reagan kept a plaque on his desk which read, "There is no limit to what a man can do or where he can go if he doesn't mind who gets the credit." When he made a mistake he owned up to it and tried to correct it if possible. Once when asked about his legacy; how he wanted to be remembered, he said he wanted people to say, "He tried to expand the frontiers of human freedom in a world at peace with itself." 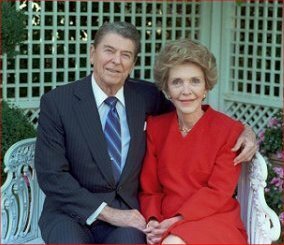 In his later years after he left the White House, Ronald Reagan developed Alzheimer's disease. In 1994 he wrote a letter explaining the sad situation and simply dropped out of public life. There were no more pictures or interviews with him after that time. He lived for ten more years, passing away in 2004. 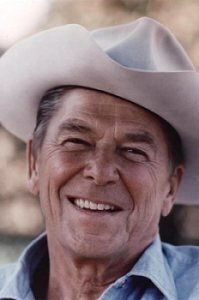 This biography by Patsy Stevens, a retired teacher, was written in 2008.
a body of electors; especially : one that elects the president and vice president of the U.S.
"President Reagan's Humor" and "Tear Down This Wall"
At biography.com search for Ronald Reagan. Press "Go" to search for books about Ronald Reagan. This page displayed 97,901 times.